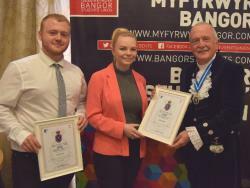 A Bangor University student project which aims to educate local people on their legal rights has been recognised by the High Sheriff of Gwynedd for its contribution to the community. Street Law is a student-led initiative which aims to make the law more accessible to the local community. It sees students deliver presentations for free to schools, youth groups, the Women’s Institute and other community groups on aspects of the law which may affect them, such as criminal law, consumer law and employment law, and strives to raise people’s awareness of their legal rights. Project Directors Keira Hand and Tom Crofts, both final year LLB Law students, were presented by Dr Peter Harlech Jones with a monetary prize of £750, which will be used to further develop Street Law’s provision. Keira, from Wrexham, was also singled out for an individual prize in recognition of her commitment to volunteering in the two counties. “I am over the moon to have had my work as Street Law Director recognised, especially from a long list of deserving nominations”, said Keira, 21. “I have been part of the project for the entirety of my time at Bangor University and it, in turn, has had a huge impact on my time as a student here. She added: “The £750 awarded to us will go a long way in ensuring that our work in the local community continues and improves. We intend to use the money to pay for members to take their minibus tests, which will mean we can extend our reach to the wider community”. The team’s commitment and dedication have also been recognised by Bangor’s Students’ Union, which awarded Street Law the ‘Most Improved Society’ prize at their annual Society Awards last weekend. If you would like to contact the Street Law team to arrange a presentation, email streetlaw@bangorstudents.com. Areas of expertise include anti-social behaviour, police powers, employment law, consumer law, and, from September, mental health law.